This is one of those books whose content is impossible to review. Martin Luther King stands as one of the greatest orators, social leaders, activists, and human beings this country has ever produced. His work from the Montgomery Bus Boycott, through the historic March on Washington, to his “I have been to the mountaintop” speech to the striking Memphis sanitation workers—the night before his assassination—is enough for three remarkable lives, much less just one. Through the end, Dr. King preached the glory and necessity of nonviolence. In the end, this alienated him from some African-Americans, who espoused more direct confrontation with their oppressors. Indeed, after King’s murder, violent race riots erupted in cities across America. To a group of junior high students, he said “If it falls to your lot to be a street sweeper, sweep streets like Michelangelo painted pictures.” He dared say that the greatest stumbling block toward racial harmony was not the Klansman, but “…the white moderate, who is more devoted to `order’ than to justice.” King took us all to that mountaintop, and asked us all to judge one another not by the color of our skin, but by the content of our character. 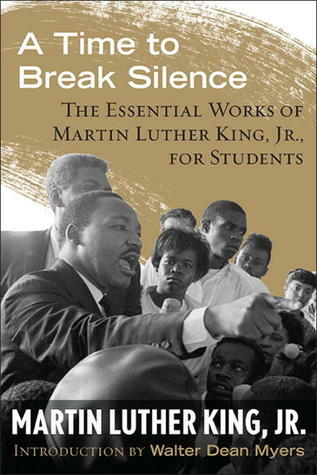 These speeches and essays all appear in this collection, “A Time to Break Silence.” This is the latest in the “King Legacy Series,” compendia published by Beacon Press in conjunction with the Unitarian Universalist Veatch Program. These books are aimed at keeping the immortal, vital words of Dr. King alive for a new generation. “A Time to Break Silence” is designed for use by students. Each speech, sermon, or essay is followed by review questions, which teachers could use either for in-class discussion or for homework or essay assignments. Much of the wisdom here is in lesser-known works. One line that rings so true today is, “A nation that continues year after year to spend more money on military defense than on programs of social uplift is approaching spiritual death.” With the war in the Middle East taking up huge gobs of money while unemployment runs ever rampant stateside, he could have made that speech today, instead of 1967 (one year to the day before he was killed). Reading this book, I found wisdom that did not die with Martin Luther King. So much of his work is as valid today as it was then. This book is a wonderful introduction for today’s generation—or yesterday’s—to discover it.